SpectraLight Ultraviolet Pool Systems harness the power of ultraviolet light to lower chemical levels and eliminate chlorine by-products, to make pools safe, healthy, and easy to manage. 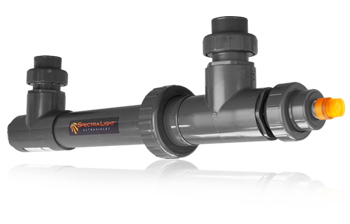 SpectraLight sterilizers are easily connected between your existing filter and the water line returning to the pool. 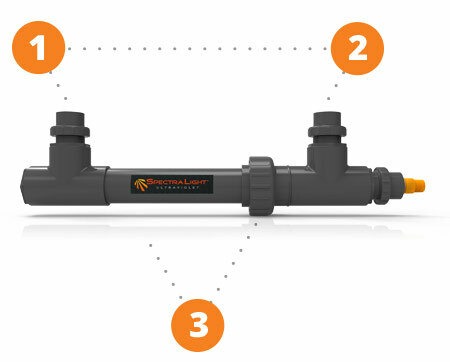 Smart Connex allows you to rotate both ports 360 degrees, so installation is easy for both new and existing pools. Your existing PVC pipe between your filter and pool can be easily spliced and glued directly into SpectraLight's built in unions. SpectraLight can be ordered with any size ports. Or the ports can be reduced with off the shelf PVC bushings to match your piping. SpectraLight requires very little maintenance and uses the same power as an ordinary light bulb. Just set it, forget it, and sleep secure knowing your pool is protected by the power of SpectraLight Ultraviolet. SpectraLight is 100% safe. Ultraviolet light cannot pass through the graphite housing. Ultraviolet has no risk of overdose and produces no toxic by-products that are common with chemical disinfection. 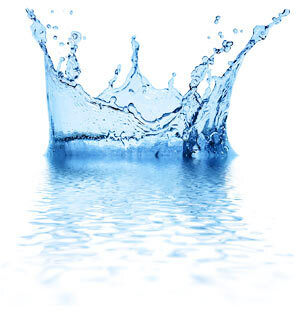 Ultraviolet disinfection is approved by the Environmental Protection Agency for the disinfection of drinking water.